The Eddyline Bistro Cafe is the perfect place to enjoy a beautifully prepared dinner with friends or to chill out on the weekend over a leisurely brunch. When the weather is fine, enjoy your meal on the deck and soak in the fabulous view of Hudson Bay Mountain. Please click on our 'Menus' link above to check out our current menus! Weekend brunch at the Eddyline is second to none! Our take on the classic Eggs Benedict is a favourite with the locals as well as visitors, and there are many other delicious brunch choices. Spend an evening at the Eddyline Bistro and enjoy beautifully prepared dinner French-inspired cuisine. Our menu showcases local specialties like Bulkley Valley free-range grass-fed beef and seafood from BC's north coast. Our Sommelier offers an ever-changing wine menu that includes some top BC wines as well as international cellar selections. Our selection of beers includes Canadian craft brewery offerings as well as imports. Beans sourced from JJ Bean turned into the tastiest coffee North of Whistler. Our desserts include French classics, from tarts to tasty truffles, to filled Macarons! Call (250) 877-0122 to reserve THE EDDYLINE BISTRO for your reception or party. 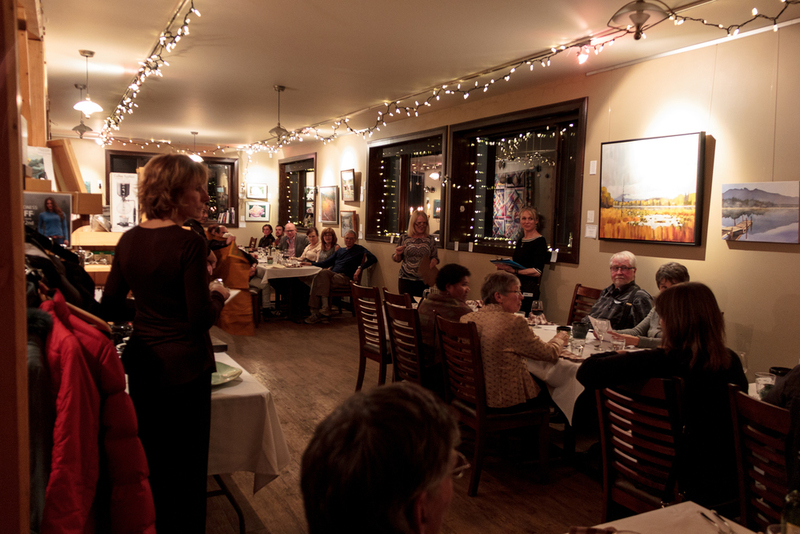 With seating for 50, fabulous food, a liquor license, and a knowledgeable Sommelier, the Eddyline Bistro Cafe is the ideal venue for your next event. We will work with you to develop the perfect menu for your celebration. As well we also provide off-site catering services. Give us a call to talk about ideas, details and dates. Fill out the form below with your event details and we'll be in touch. Join us for a relaxing evening, great drinks and fantastic food! Our dinner menu changes frequently depending on the season and ingredients and features many beautifully prepared dishes. To stay up-to-date on daily specials and new menus, you can 'like' us on FaceBook, contact us at eddylinebistro@gmail.com or call us at 250.877.0122. Take a piece of Eddyline art home with you! Many of the latte cups and mugs used for our premium coffee’s have been hand crafted by Susan Clay-Smith. She holes up in her home studio whenever possible to create some artful pieces. You can often purchase mugs to take home from The Eddyline and you may find her work in various other locations in Smithers.